Like any other week on Big Brother 2014, the HGs had their target set on someone and it was known before the weekend was over and nothing was going to change their mind! Zach Rance is an evil person and he has to go! Well, we don’t think Zach is half bad and a lot better person than most of the HGs on Big Brother 16! However, he is on the block and most likely walking through those doors tonight on Big Brother 16. Who do you think goes home tonight? Vote in our Week 8 poll below in our Big Brother 2014 spoilers! The Big Brother 2014 spoilers have given us plenty of details on what has been going on in the Big Brother 2014 house, even though it has been a pretty slow week. It turned into a bash Zach and bash Donny week, as the HGs prepare for next week and justifying their actions on wanting Donny gone next. However, tonight we will see Zach and Cody sitting in those chairs and no one has batted an eye to think how Cody has made it this far in the competition and done absolutely nothing (besides touch hands with Christine non-stop)! One of them will be evicted tonight, but could walk right back in with the jury competition tonight! Join us tonight on Big Big Brother for our Big Brother 2014 Live Recap. Let’s watch together and see who was evicted on Big Brother 16 tonight! Find us on Twitter and keep up with us on Facebook. Don’t forget Big Brother 16 live feeds for even more Big Brother fun, but uncensored! Every sign up helps support this site to keep bringing you Big Brother 2014 spoilers, news and gossip all season long. and we love you for your diligence in keeping us updated with all the craziness that is BB, Todd. Thanks….we try to make everyone happy! Todd do you know anything about the Renom rule in the BB house and how it works. I was wondering about that too. At least in the case of BOB winners. It is all over the web Kim on how the rules are broken and nothing being done about it because it is in the favor for Frankie. Just google big bother house guest rules everyone. Which house rule are you talking about? If it’s the one about not telling a nom that he will be nommed and evicted then it’s already been discussed. BB has done nothing about it all season. Devin did the same. And it’s a rule they have only enforced once in all seasons that i can remember. I just sent it to you I hope you get it okay. Really now that would be awesome. It they had enforced it once they should stand by their rules. Season 12, Jeff told Brittany that she would be nommed (along with Lane). He was called to the DR and told he couldn’t do that. He had to change his noms to Lane and Ragan. According to the BB rule book, you are not allowed to tell someone BEFORE the nom ceremony that they will be nominated. Same applys to the renom. There is supposed to be a penalty if you reveal it to them before then. But there hasn’t been since Season 12. Cat answered it perfectly, of course! Even Frankie’s sister tweeted out about the rule and that is why Frankie did it. He knew of the rule and would not be able to nominate Zach, which was the whole plan. Yeah, that did not work out well for her thinking! Tonights’ show should be really interesting. Sending up major prayers and wishes for a good hg return and Donny or new HG to win HOH! I agree. Knowing that it will probably be Zach that will be evicted, I’m hoping that he is the HG to return, and I hope he returns with a vengeance and is out for blood! I hope that the winners of HOH and POV are, in either order, Zach and Donny! And the first two nominees are Frankie and/or Derrick! That is exactly how I wish it would be also. Sorry, I didn’t complete my thought, I meant Frankie AND Christine/Derrick, either one would do! I think it would be more fun to see Frankie and Derrick–they both would be in a state of shock and disbelief. Wonder who would be able to talk their way out of eviction since they are both such accomplished liars. I SADLY,SADLY cast my vote for Zach. (Of course, I am only voting in the poll–in the real diary room, I would GLADLY, GLADLY cast my vote for Cody! Ok, I have to ask– is there something weird about the wrinkle or crease or whatever on the front of Cody’s shorts?? That’s where he’s keeping his socks so the “saboteur” won’t steal them. Apparently he knows you are supposed to put the sock in the front and not in the back but it still looks a little bizarre! OMG how hilarious, I bet Christine was not far from him either. That was a great answer, Cat!! I was thinking after seeing how filthy the house is in the bedrooms, that maybe the shorts are so dirty that they stand up by themselves and gravity caused the wrinkle. I like your answer better, though. Although I wanted to vote for Cody cause that’s who I’d like to see go, I voted for Zach who we know will go. I can’t believe anyone would think Cody will be evicted over Zach. The writing is pretty much on the wall. They’ve even loaned him a couple of clothing items so he can go out looking good. It’s either going to be a very sad night or one to celebrate. I’m hoping for the latter. Especially if Zach wins the comp that gets him back in the house. We will see a grin on Donny’s face, terror in the eyes of Frankie, Derrick and Christine and Caleb and Cody will just be oblivious with “I Am Stupid” written across their foreheads! Ought to be a fun night for us viewers! I voted for Cody even though I know it will be Zach. Wishful thinking I would imagine. I thought I was the only one, but I did too 🙂 As you say T-Bird, wishful thinking. I really don’t think the return juror will get a weeks immunity. Last year they held one comp for all the hgs and jurors. Whichever juror caught the most balls (i think they had to catch a specific number) won his/her return. PLUS they were eligible to win HOH if in the end they caught more than anyone and filled up their tube faster. So the return juror may only be safe if they win HOH also. I honestly can’t remember him getting immunity last year but Todd probably remembers better than i do. They might change the rules but i’m doubting it but hoping for it. And if they play the same kind of comp we might be disappointed in who wins. Derrick has played baseball a lot so might be better at the game. i hope Donny wins HOH and the return player decides to work with him. Maybe the “Bomb Squad” will stay together, but the “Detonators” and the “Hit Men” will definitely get hurt!!!!! I’m hoping it’s a comp that the three stooges, plus two can’t win because they can’t cheat(i.e, Christine)! I tried looking at my posts from last season when Judd came back and never saw anything specific that I typed, but I did say something about Judd being safe for the week. Not sure if it was because of who won HoH (Elissa) or because he was given safety. For some reason, I feel he was given safety for one week. Feeling sorry for Zach, I want him to stay, but if not hope he comes back in the house and teams with Donnie..
I’m still getting used to this tablet! I was trying to get “like” on this comment and ended up flagging it by mistake! Anyway, I’m in complete agreement with you Sandy! And did figure out where “like” was by trial and error. I sure hope Zac brings up the fact that Cody has done nothing in the game and doesn’t deserve to stay in the game!!! I want to hear that, too! In fact, since there is probably zero chance that Zach will be staying, he should have the greatest “Zack attack” of the entire summer and hold nothing back! Glad to see you back Meowzer! Can’t wait for tonight either!!! don’t think that’s going to happen. But can you see the looks on the faces of the detonators if zach returns. with zach and donny still out numbered, but they would have a fighting chance hope donny wins hoh nominates derrick and frankie. thats derrick dust and ferry dust. one goes off caleb would be the pinch hitter. Another thing in our favor is these boneheads are “positive” there will be one more week of BotB. So maybe that combined will the returning hg will throw them just enough to work in Donny’s favor. Sorry I have not been adding comments in a while. Have been reading all. Todd again great job on the entire year so far. It just has been so predictable I have not even watch BBAD in Weeks. Sad part is Victory will be final 2 because of the lack of respect they all have for her. The only question is who moves first Frankie or Derrick and takes her to the end. All the others are pawns. I love that, in error, you put Victory! Maybe you are predicting something with your error? I’ve seen a sneak peak on what the Jury comp will be tonight. Wish i could post the link. It looks VERY interesting! Big brother’s Facebook page posted a picture of it. I saw that as well. It’s intriguing but until it’s actually in motion, it’s hard to tell exactly what will be happening. Is it going to move? I couldn’t tell anything accept what it looks like. I’m not sure if the platforms will move or they have to move something down the platform. Notice there are 4 chairs behind the table and 3 stools in front of it. Wonder what that means? Any guesses? Looks like they each have a bin behind them. Maybe with some sort of items to toss at the target in the middle. The tables mat be for the hgs? Balls in the bins maybe? Maybe they have to stand on a moving platform and toss balls into the middle. First person reaching 10(?) wins? Yea but I don’t get the whole “ring” set up. Like a boxing ring. See the ropes all the way around? And there are exactly enough chairs around the table for the hgs. You’re right about their being enough chairs for all the hgs. When i looked at it i thought the back 4 were actual chairs…not stools. I should have looked at it with my glasses on :). They are calling it “The Comeback Fight” so i’m guessing that’s why the ring. Actually the back four chairs look different then the front three stools. Looks like we don’t have to worry about Jacosta coming back…. Wouldn’t THAT add insult to injury?! I can’t tell if they’re all stools or chairs AND stools. The pic is not clear enough. 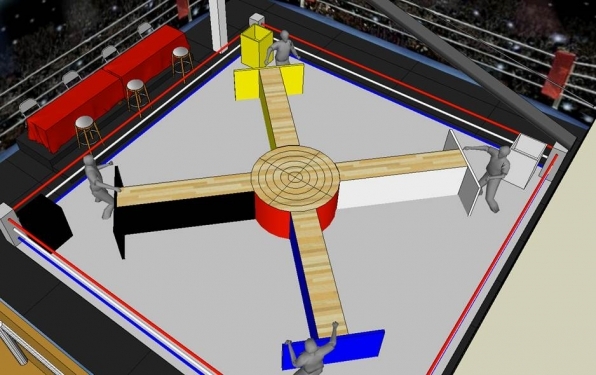 Funny, that’s what I thought it resembled as well, a boxing ring. Maybe the comp is sort of like curling, trying to nock their opponents whatever, out of the middle position. I’m betting you’re right, Mary. There’s only one table visible. And wouldn’t they seat them all the same way at the table instead of having 3 stools in the front? Maybe a place for the houseguests to sit and watch? I thought it looked like the contestants will be moving it. Of course I really don’t know, that’s just how it looks to me. I’m scared to even think about it. Looks very physical. Not sure which hg i’d place my bets on to return. Another thought….Are we sure we will see the HOH comp on the show tonight? It’s possible it will play out on the live feeds. Especially if it’s endurance. I saw a picture of the challenge on Facebook and it doesn’t look like endurance to me. That’s the picture of the jury comp. The HOH comp could still be endurance. I thought it would be an endurance comp for all of them, like the ball catching last year. It looks like two separate comps, so who knows. They have been building for a while, so I am thinking it will be endurance and on live feeds. We are well overdue for one! Todd, have you heard anything about Julie taking the “ice bucket challenge” on the show tonight? Yes, I saw that she tweeted and was challenged to do it and she may do it on the live show. If she does, that is even more time away from everything going on tonight! I think she will and we’ll take a look at the jury house and jury member, the live vote and then have the jury comp and then start of the endurance HoH comp. That is my call….what do you think? Not much time to reflect on the awful bullying of Zach this week…. There’s actually no ice involved with any one that takes the challenge. Just VERY cold water. I don’t know … We did ice! Hey Cat…I have seen a lot of the challenges using ice in the cold water. There are many that have been posted on Facebook. Yes, I have too. Good morning Beth! AGT had some ice in theirs I believe. Mel took the challenge and now Heidi and Nick was suppose to last night as she challenged them. could it be possible the jury comp is before the eviction? Crap. Now instead of Zankie it will be Cokie. ..until the next person wins and Frankie loves them more! Yup, without a doubt! YUK!!! !